Many companies are using EzDataMunch to reduce cost, improve supply-chain processes, ensure timely delivery, track vehicle performance and keep customers happy. Our transportation business intelligence dashboards help companies to better analyze their performance by giving real-time information of all the mission critical metrics. This information can help in mitigating cost per mile, enhance on-time pick up and delivery, improve route planning, appropriate freight payments, and scheduling shipments. All this with just a click. Logistics companies generate tremendous quantity of data. This data is generated by the adoption of technologies such as transportation management solutions (TMS), supply chain execution systems and warehouse management systems (WMS). Having access to data is the key to success however, transforming the data into decision is a challenge. A smart transportation business intelligence solution help companies to turn critical data in actionable information. Many transportation and logistics companies are embracing business intelligence / analytics solutions to achieve an edge in their performance. Companies have realized the importance of having a transportation analytics tool. Many say it’s a must to have software as it’s the highest-ranked functionality requested by customers according to a study done by a leading transportation management solution (TMS) provider. Evaluate suppliers, performance & control cost. 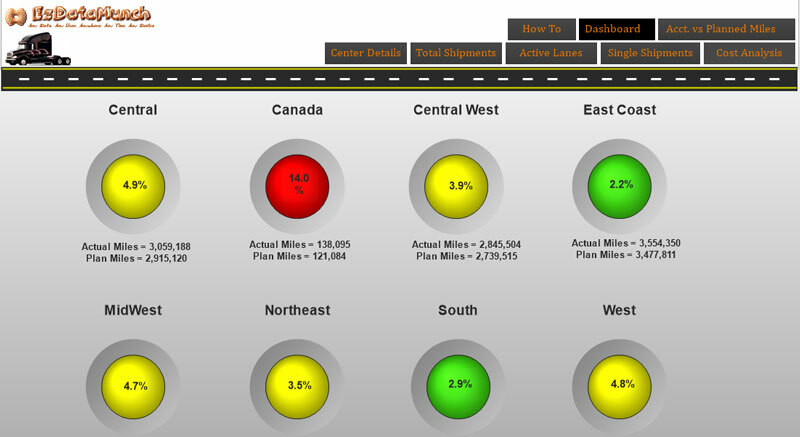 Mitigating cost per mile, enhance on-time pick up and delivery. Enhance marketing campaigns and improve ROI. Identify root cause of gaps and take corrective actions. We were looking at analyzing cost of maintenance of our vehicle fleet and cost per mile based on historical data of 20 years. EzDataMunch playbooks made this task simple by integrating their existing knowledge of the domain and our data. We were able to review details at individual VIN level in a matter of days!